One of the toughest challenges for a startup can be actually coming up with a great name – and website domain – for the business. While the brainstorming process can be a lot of fun for some, it can also get taxing. Using a tool to facilitate the process can help. That’s where a tool like Business Name Generator can come in. Here’s a look at the tool and how it could help your small business or startup. Business Name Generator can help you find the inspiration to put a permanent moniker on your startup or small business. Just enter a few words that define or describe your business and the generator will suggestion relevant ideas. The tool uses an intelligent word recognition artificial intelligence tool to help generate relevant name ideas based on your keywords. Just enter a few words that define or describe your business and the generator will suggestion relevant ideas. It can really get you thinking in new ways and jumpstart the brainstorming process. Plus, the tool generates name ideas that are related to your business or industry and checks multiple domain extensions for availability. 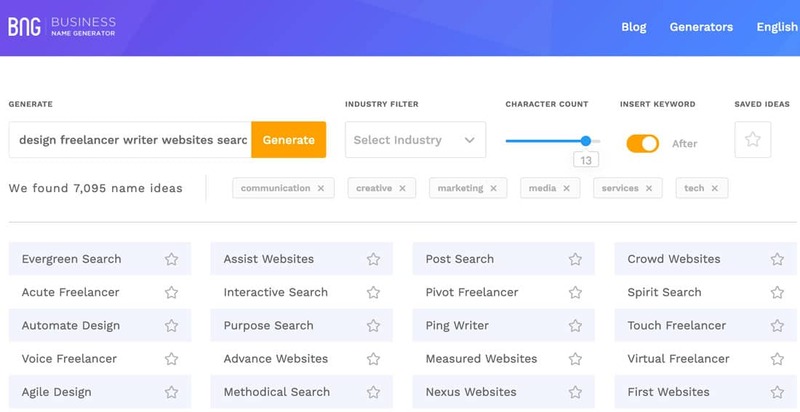 I put in this query: design freelancer writer websites search, and added some industry criteria. The tool returned 7,095 name ideas. You can star the ones you like and with one click, check domain availability for each name combination. You can see what options are available and even register the domains right there. It’s a quick and easy solution that’s born out of your digital brainstorm. Business Name Generator gives you the tools to create a name for your startup, blog, podcast or pretty much any other business venture you can imagine. Make a list of words that relate to your business and that you like. Consider words that communicate value, emotion, strength or uniqueness of your business. Enter your top words into the generator. Narrow the list even more by selecting relevant industry types. Narrow the lists based on available domains that appeal to you as well. Share the ideas and gather feedback from the rest of your team. Narrow down the options and pick the perfect name for your business. Business Name Generator gives you high quality results thanks in part to the AI-powered intelligent word recognition feature. This helps you get more names that relate to your business and industry. Plus, you can narrow the focus even more with industry-specific targeting. This might be the best part of Business Name Generator – It’s free to use. You don’t even have to create a username or sign-in to get started and name your company today. You won’t find many other tools with this many options available. There’s nothing to lose if you need to create a new name … or just want to engage in some creative brainstorming. Business Name Generator is a great free tool that can help you start – or expand – your brainstorming process and help expedite your startup processes. Give it a try. Brainstorm some new ideas, and generate the perfect name for your business, plus find a domain. Our thanks to Business Name Generator for sponsoring this post and helping to support Design Shack.